With the launch of Evolve right around the corner, lets take a look at some of the positives and negatives surrounding the game thus far. From the team that brought you Left 4 Dead, Turtle Rock Studios has the capability to build upon the success of their 2008 hit. But with mixed feelings after a public Alpha and Beta, I'm uncertain whether it will live up to to the hype or become another casualty to the recent 7/10 slump. 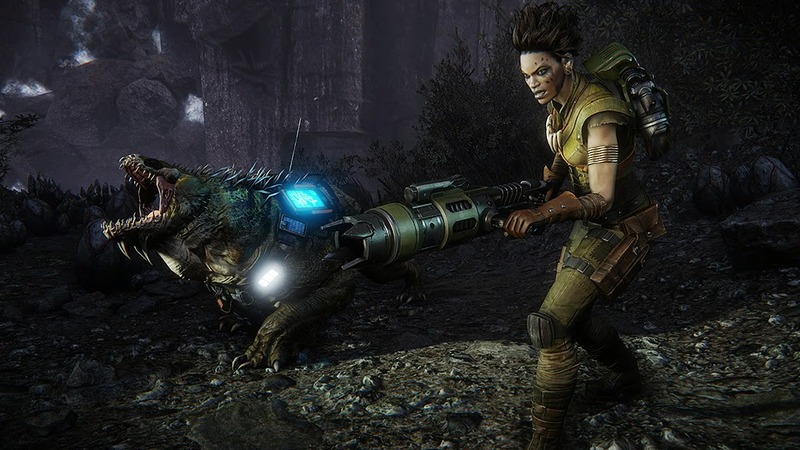 One of the most promising aspects of Evolve is how much the game has been publicized pre-release. With hours of gameplay footage on YouTube, live streams on Twitch, and a public "Big Alpha" and Beta all available to any prospective gamer interested in the title. This is especially a good sign now, when a few recent games have pushed their press embargo dates to after the launch of the game. Speaking of the Alpha and Beta, these are true public Alpha and Beta tests. It seems that the industry has conditioned us to believe that anything titled "Alpha" or "Beta" is just a glorified demo. But that isn't the case for Evolve. They frequently ran tests, encouraging players to get on at specific times to stress-test the servers. But more importantly they have been making changes to the game based on player feedback and analytics. Make the Wraith easier to track. Even good Hunters have a hard time keeping tabs on Wraith because she can move so far while cloaked. Make the Decoy less spammy. It doesn't take any skill to keep punching that ability button and let the AI Decoy go to work. We want to increase the “cost” of using it so that people use it more sparingly/strategically. Bring Supernova down a notch. It is okay if it’s her primary damage dealer, but it felt a little on the buff side for a while internally and we saw it prove true during the Beta. Make Abduction a little easier to land. It’s a really fun ability to use and it was underutilized during the beta. Make Warp Blast a threat. This should be a straight forward damage dealer that also has some nice mobility utility. Wraith can no longer warp while cloaked. If she does, the cloak wears off and the Decoy vanishes (just like when you melee attack). This means that when she cloaks, she normally won’t get far and it opens the door for skilled players to do smart things like break line of sight before warping away. Decoy takes 30% longer to cool down. This immediately makes it 30% less spammy and hopefully results in players saving it for the more opportune moments. Supernova damage reduced by 10%. Not a huge change, but it will make a measurable difference. Abduction radius increased by .5 meters (now 3.5). This will make it a little more forgiving. Warp Blast radius increased by .5 meters (now 8.5). Increasing the radius here has proven a great way to increase the damage output in the past as players are able to hit their targets more often. 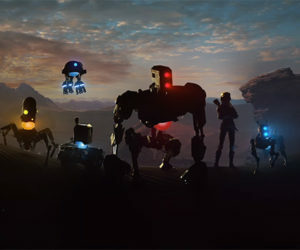 Evolve also boasts a unique blend of Cooperative and Solo multiplayer gameplay. As the Hunters, you have to work as a team to take down the individually-superior Monster. Each player is assigned a different class, and each class serves a specific role. The Assault is the primary damage dealer, the Trapper is in charge of finding and trapping the monster, the Medic heals the team, and the Support gives out various buffs. Each class is unique and everyone has to play their part for the Hunters to stand any chance against the Monster. Defend: A starship's refueling station comes under the assault of a player-controlled fully evolved monster and smaller Goliath minions. The hunters must stop the monster from causing a catastrophic accident by protecting the power generators until the ship is fully powered, while the monster must destroy two generators to reach the ship's power source. Evolve even has a mobile game titled Evolve: Hunters Quest which allows players to upgrade their characters by transferring "Mastery Points" to the console and PC games. With all of that said, what could possibly lead someone to have second doubts about the game? As with any case, with the good comes some bad. Lets look at the negatives leading into next weeks launch. Even after all the tweaks from the Big Alpha to Beta, and Beta to full release, there are a few gameplay issues that need to be addressed. First is the tracking. When playing as a Monster your first order of business is to run and hide until you can evolve to stage 2 and 3. A successful Monster will get to stage 3 without ever having to fight the Hunters. That is all well and good IF you are playing as the Monster. If you happen to be on the opposite end of the match, constantly chasing down and looking for the Monster as a Hunter, it might not be the most enjoyable experience. Especially considering how powerful the Monster is at stage 3 (almost guaranteed victory). Another glaring issue, also to do with tracking, is the lack of a pet animal for any tracker other than Maggie. There are three characters to each class, and each has a few unique abilities and equipment. The three Trackers are Maggie, Abe, and Griffin. Abe, who I didn't unlock during the Alpha or Beta, is equipped with a Tracking Dart Pistol which allows you to track the Monster by tagging it or the animals it eats. I have yet to play as Abe so I'm not sure how effective the Tracking Dart Pistol is. Griffin has Sound Spikes which can be planted in the ground and sound an alarm when the Monster passes by. However, only five of these can be planted at a time and the Monster won't trigger the alarm if it crouches past. Not to mention the Monster can also see the Sound Spikes by using the Sense ability and simply avoid them all together. This results in a pretty useless item for tracking the Monster. The third character is Maggie, who has a pet Trapjaw named Daisy that tracks the Monster down and also revives teammates. As the first Trapper to be unlocked, the Maggie-Daisy combo seems too good to switch to the alternative characters. The main issue arises when the Monster crouches and doesn't produce any tracks. At this point it's up to the Hunters to either visibly spot it or wait until the Monster startles a group of birds. A good player won't do either of these, which is why Daisy is so useful. Daisy can track the Monster without any visual ques or tracks. Hopefully Turtle Rock can get this sorted out by launch. 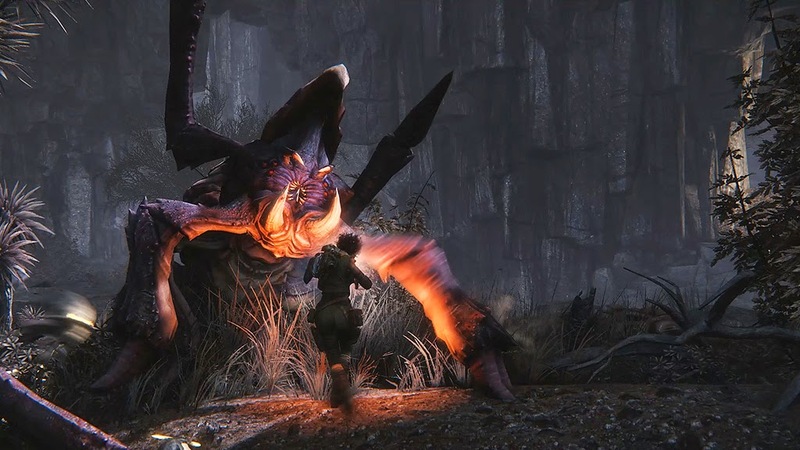 The other big issue with Evolve is the lack of a traditional story mode. This shouldn't come as much of a surprise to fans of their previous hit, Left 4 Dead, which strung a few random missions together and called it a story. But there was a more sense of structure to Left 4 Dead which Evolve is clearly lacking. The developers have touted the Evacuation mode as their form of story. A sort of playlist which combines maps, modes, and gameplay alterations into a five round series. The winner of each round gets a bonus added to the next map such as increased wildlife for the Monster or armored turrets for the Hunters. Essentially it's five multiplayer matches that are slightly intertwined to serve the role of a story alternative. The last, but definitely not least, issue with Evolve is its expansive, confusing, and sadly all too familiar pre-order bonuses. 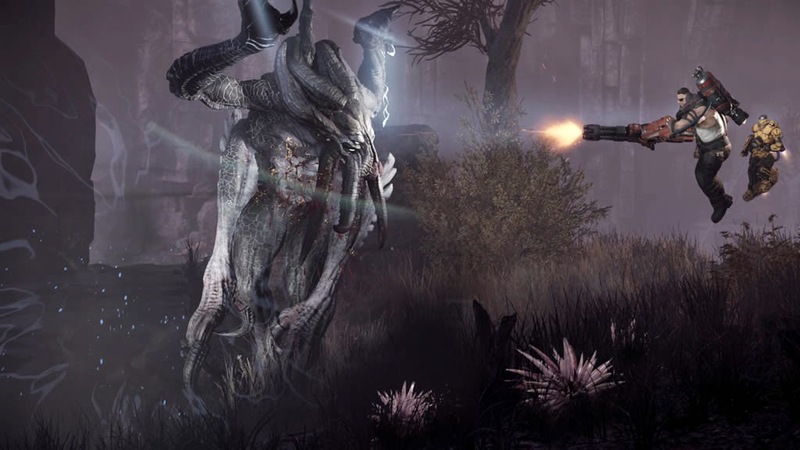 As it stands there four different pre-order bonuses for Evolve: the Xbox One Digital Exclusive which includes four Monster skins and unlocks the tier-3 Hunters, the GameStop and EB Games Exclusive which includes four unique weapon skins, the Amazon Exclusive which includes instant access to tier-2 Hunters, and the Monster Expansion Pass which the Savage Goliath skin and a fourth monster, the Behemoth. All of which is separate from the Evolve Hunting Season Pass which costs $25 and comes with four new characters (one for each class), and three Monster skins. The developers have repeatedly stated that the different pre-order bonuses will not split the community. Meaning no matter what bonuses you have (or don't have) you will be able to play with everyone else. But looking at the list above, how are all those exclusive items not going to split the community? Sure, I'll be able to play against someone using the Behemoth if I don't choose to pre-order the game, but I still won't be able to unlock it for myself. The same goes for the characters and skins. If I choose to purchase the game from Best Buy instead of Amazon for example, I won't have access to higher tiered players right away while others will, or use cool new skins that others have. While these differences might not split the community in terms of being able to play with each other, they do split the community between the haves and the have-nots. But I'm a little big biased on the subject of pre-ordering games. These changes may not affect the average gamer that is excited for Evolve, and may simply serve as an added bonus to the game they were already planning on buying. But if you ask me, pre-ordering games in general is how we got games like Assassin's Creed Unity and Halo: Master Chief Collection. By giving money to developers months or even years before the game is completed, we're giving them the freedom to slack off. This isn't true for every game or every developer, but by and large there is very little reason to put money down on a game that is months away from release. But I digress. Evolve is a curious case. The argument can be made for or against buying/playing the game. I don't think any amount of reviews or scores will change gamers minds. The good news is that you don't have to rely on either to help make your decision. As I stated before there are tons of gameplay videos on YouTube (here's is one from me!) and the developers are constantly streaming on Twitch. That is of course if you don't mind the lack of a singleplayer campaign and the myriad of pre-order bonuses. I myself am willing to give the game a try. But I wouldn't waste my breath convincing anyone else to join me. 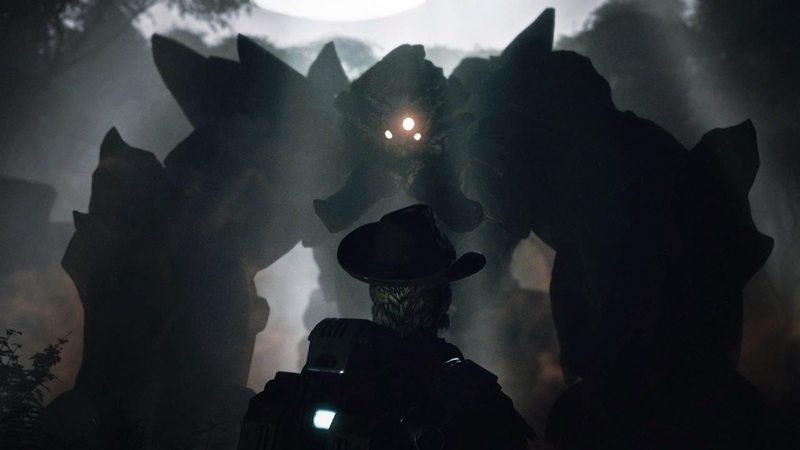 Let us know what your plans are for Evolve in the comments below!